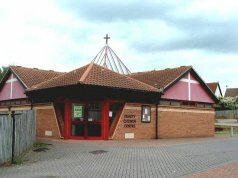 Trinity is an ecumenical church situated on a rapidly expanding housing estate north-west of Norwich. It was built in 1991 by the Methodist and Anglican Churches in partnership and now boasts a membership from several denominations. Trinity is a Local Ecumenical Partnership comprising the Anglican Churches in Taverham and Drayton and Drayton Methodist Church. Monday: 9.30 to 11.00 am "Mothers and Toddlers". Tuesday: "Space For God" from 1.00 pm to 2.00 pm. An informal get-together for discussion, Bible study and a variety of topics. All are welcome. "Messy Church" happens at Harvest, Christmas, Easter and Summer holidays. This Church is in The Norwich Circuit. A list of all the churches in The Norwich Circuit can be found lower down this page.